When Cathy Newman of Channel 4 interviewed Jordan Peterson1 it was plain that they had a hard time agreeing on anything. My concern in this small discussion is to try to find a graphical representation of why it is difficult for two people to have a meeting of minds. The model explored here supposes a philosophical space where two people start at different points and try to move towards a point where the distance between them is minimized. The picture at right is a representation of a philosophical domain. 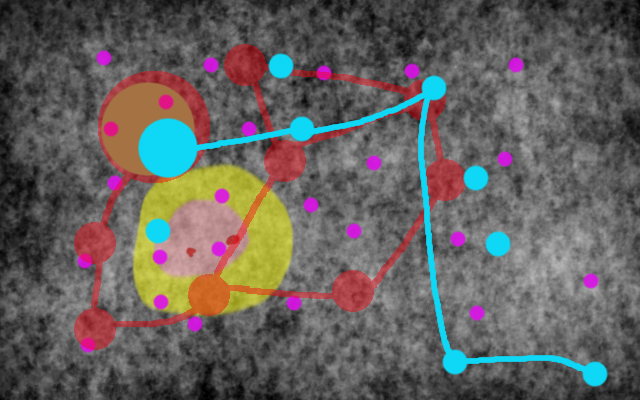 It contains a background of varying grey intensity, overlaid by several coloured layers with circular-like objects, some connected by lines. The different colours represent different philosophical structures, explained below. 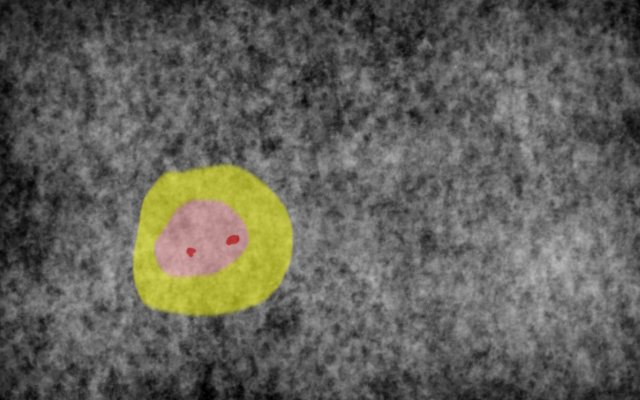 The image is a 2-D projection from a high dimensional space, and the axes are defined as in a plane from a high dimensional array such as that generated in word2vec2. Since any point in the space can represent ideas from a physical horse to abstract courage the axes represent some metaphysical quality that all ideas have in common. Precisely what that is remains undefined. The intensity of the grey background represents the value received by visiting that point. The darker the pixel the less the value. The represented values are purely arbitrary in this illustration, however they are important in that each person will prefer to move to a point of higher value, or rather has an incentive to move away from a point of low value to one of higher value. 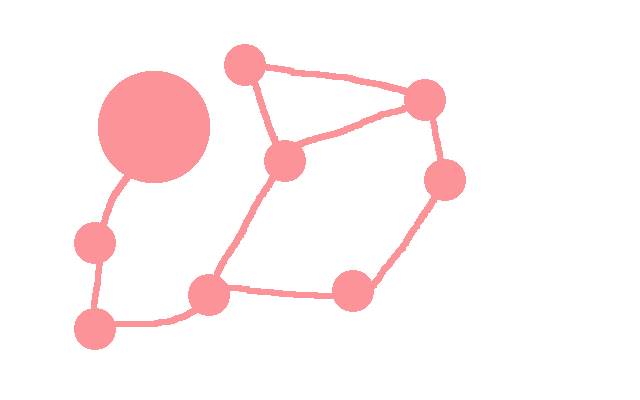 To simplify things, in this picture there is a white background with a pink structure of circles, all of which are connected by lines or edges. The white background indicates that all pixels have equal value. The pink areas represent a domain of knowledge. The circles, let's call them 'gnodes', are areas of intimately connected ideas that are well understood, and the lines indicate that there are narratives that connect these areas together, narratives that are accepted by the group that acknowledges the foundations on which the domain is built. The narratives consist of many small steps towards the destination, each of which has its own reward. The narrative lines may disappear in a different projection from the full dimensional setting. As an example, say this structure refers to science, and the big circle represents what we know about numbers. One of the smaller circles represents arrays, and another, functions. 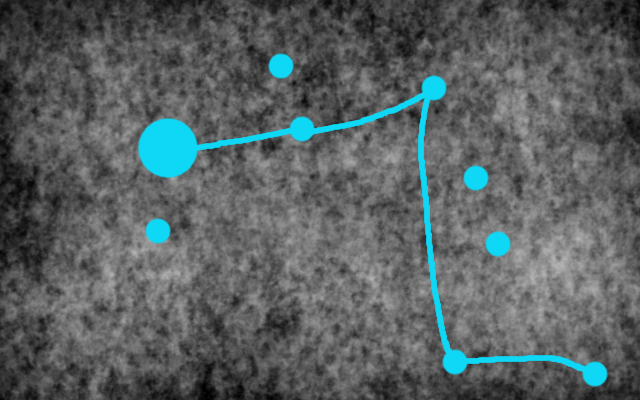 These are connected via narrative edges that concretely link them, perhaps through intermediary areas. In this view, the green gnode represents a type of universal knowledge. By this we can imagine that the quality of five-ness, that is something that sits between four and six, is something agreed by all parties. Five means countably five, whatever label it is given. Five beans in a row is always five. In the domain of science five is countably five, and in religion if the Bible states 'five loaves' then we can assume that is what is meant, not five hundred, a number that would considerably diminish the point of the story. The circle sits on an area of the background that indicates that some points are more valuable than others; perhaps this is true because, to take one example, we use the idea of a dozen more often than the prime numbers above a trillion. This new patch with three different colours represents a difference tree structure. As humans we can recognize the difference between things when viewed side by side. 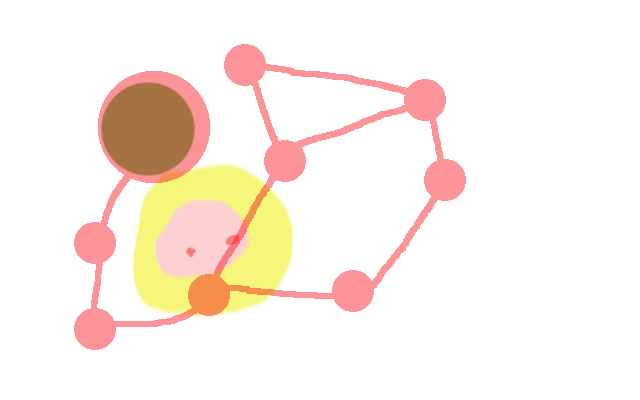 Say the yellow covers animals, the pink inside the yellow indicates quadrupeds, and the two small red dots represent dogs and cats. Both dogs and cats are quadrupeds and animals so they belong in the yellow and pink areas, but fish, as animals but not quadrupeds, would be somewhere in the yellow. Plants are not animals, so they would be represented by a different patch. But both plants and animals would be located inside the patch representing living things. You get the idea. For further discussion of the tree, including an interpretation of God, see this discussion. Increasing the complexity a little, here is the science example above combined with the universals (the two large gnodes conveniently superimposed) combined with the difference tree structure. In this particular projection note that the edge connecting two of the science circles passes close by dogs. Does this imply that dogs are part of the scientific narrative? Perhaps yes, perhaps no. This is after all a 2-D projection and in the true n-dimensional view the distance might appear much larger. If we change the projection the proximity might be much less obvious. Now here is a new image with ecclesiastical purple dots. 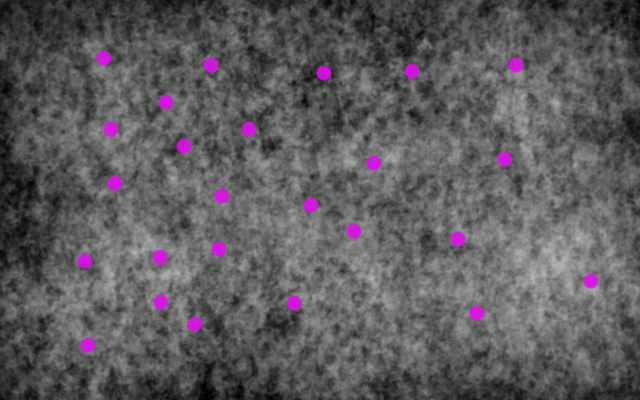 Let's say the dots represent the domain of religion; when a person is faced with a choice of leaping to a new point in the philosophical domain the purple dots represent those areas where that person, in common with others also of a religious frame of mind, would feel most comfortable. One of the dots might tell us a lot about love but nothing about the composition of moon dust. There are no lines or edges connecting the gnodes; unlike science where there are many small steps between gnodes, in this case we know where to go but to get there we need a direct leap. We can jump from one dot to another directly using the Bible, or an appeal to God's mercy, but in this projection there is no narrative connecting say love with the Ascension by means of incremental progress. Clearly this is an important point - if there are edges based on theological thinking that link the circles that appear in other projections then this can be made clear during debate. 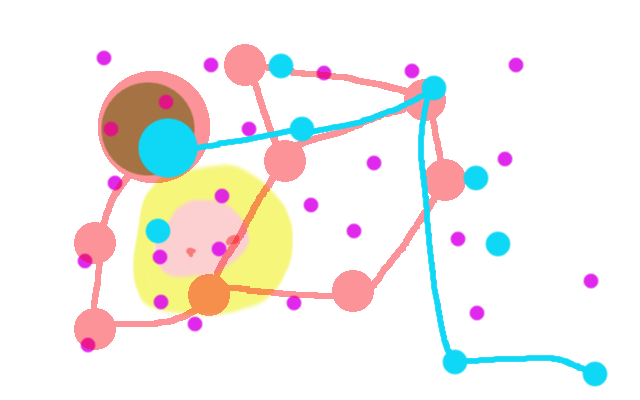 Yet another possibility is a domain where some dots are connected but others not. This image might represent the social sciences, where some claims and observations may not be so easily backed by logic, clear observation and experiment. 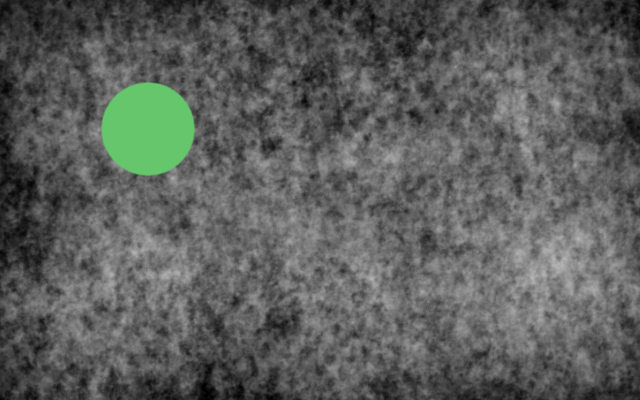 Note that the big dot coincides with the universal numbers again, but it is difficult to connect all the dots with narrative. And finally here are all the domains in the same projection. If your favourite combination of domains is not visible then blame it on the angle of the projection from the full n-dimensional space. Considering the background alone, it is quite possible of course that two parties in a discussion face different backgrounds; each will face a different map and would have to guess if the other person did or did not value the process or the outcome. If one argues from the point of realist philosophy and the other from a relativist viewpoint then it will be much harder to know if at the end point of the conversation if both parties are happy. For an examination of how computers can emulate decision making by a single person in such a space see here. So how does all of this help to elucidate the process of argument and debate, particularly with regard to computational philosophy and human machine interaction? The result of a successful discussion would be that two or more persons starting from different points in philosophical space achieve a meeting of minds (that is with minimal distance between them in philosophical space) where both parties feel secure and derive some benefit. If both end up at a point that is completely black in philosophical space then no-one benefits. Computers have no problem measuring the distance between two points in n-dimensional space; they just need to work with some sort of numeric array-picture. Moving from one point to another in philosophical space involves following established links between circles to get to a new point. If one person uses one structure and the other person uses a different structure the chances of arriving at a common point are quite remote. Viewed this way, the most likely outcome is polarization and polemicism. So the solution in the case of Newman Peterson is not to expect an agreement at the end but to acknowledge the steps in the process the other is using. In this regard we may look forward one day to an impartial machine which can actively moderate and direct the progress of a debate such that both parties benefit.